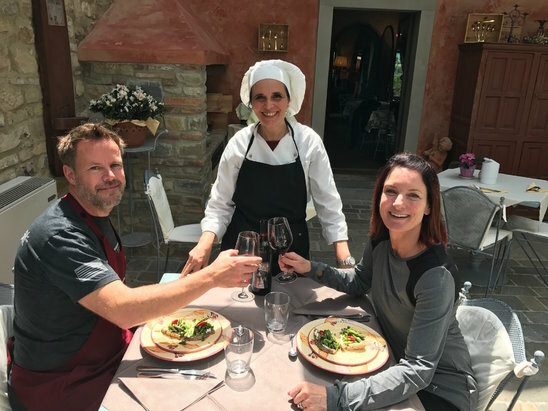 We can’t thank you enough for the fabulous experiences we’ve had during our “Your Tuscan Sun” tour. Words fail us — and that’s saying something! This was a “bucket list” trip that I only dreamed of and you both made it a reality and then some. We gauge our experiences on fun, history, education and “feel.” You hit ALL of these criteria making this a memorable time for us both. We appreciate the attention to detail, the ease with which you handled everything and the bragging rights you’ve provided. If we are able to come again, or hear of someone wishing the same experience, you will be TOPS on the list. Thank you both again. Please keep us in mind if you make it to Colorado. We’d be happy to direct, host or just say hi. We miss it alreay...our hills seem EASY! Gosh, I hope we see you again sooner than later...major highlight...kids were worried and they ALL loved it....it was a family day for the memory books and we have you and Graham to thank for it...THANK YOU!!! 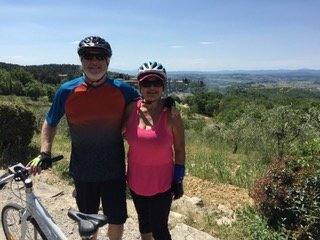 As you can see I'm proudly wearing the I Bike Tuscany bike jersey that I bought from you after our ride in Florence back in September. 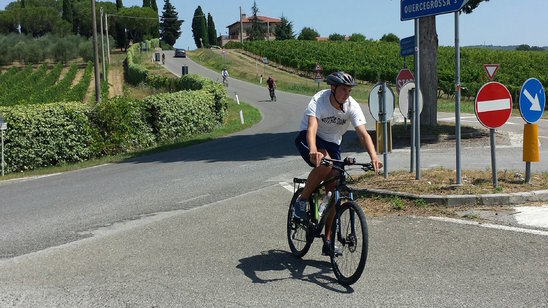 Matt and I are planning to return to Florence to celebrate my 40th birthday so will definitely be getting in touch with you to book another ride. 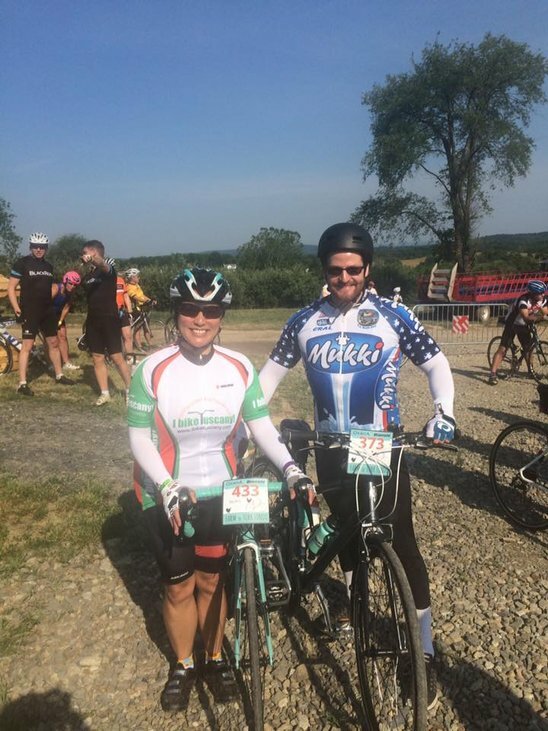 As promised, attached is a photo of the two of us biking with your great IBT jerseys! 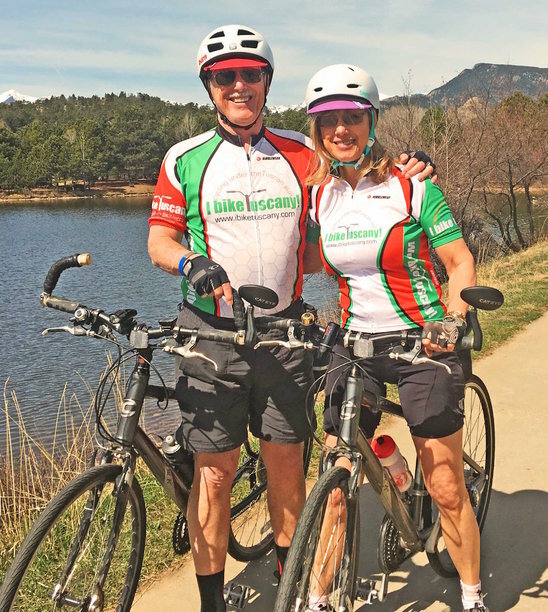 We were celebrating our 29th wedding anniversary, with a 3-day stay in beautiful Estes Park, Colorado, which had a pleasant bike trail loop around the lake. Now that the weather is much warmer, we're back in the saddle again! We hope you and your company will have a very successful summer.